In brief: Larry Cain has once again edged out Bart de Zwart to win the almighty Chattajack race in Tennessee, with the Canadian claiming his fourth-straight title in what has grown into one of the world’s largest races. 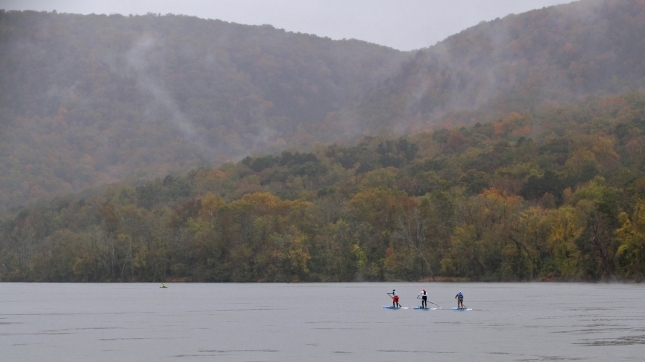 More than 500 paddlers took on the 31 mile odyssey down the beautiful Tennessee River Gorge, with the former canoe gold medalist extending his winning streak and relegating Bart to a third-straight runner-up finish. Conditions were cold, wet and challenging this year, though a solid downstream current did provide some relief. John Batson stuck with the leaders virtually the entire course, which ensured a podiums weep for Team Starboard. Despite the rough weather, the top three all came in under the old course record. Seychelle Hattingh cleaned up in the women’s race to cement her status as one of the world’s best endurance paddlers, while about 25% of competitors were listed as DNF after suffering from extreme cold (borderline hypothermia) and pulling out mid-race or simply missing the cut-off times.